With over 28 years experience we offer all forms of tree / vegetation removal ranging from acres of trees / vegetation, to the removal of just one solitary stump. All enquiries will be dealt with in the same professional manner. 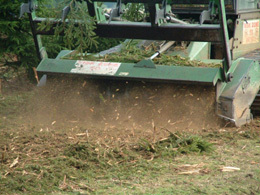 Commercial clients Nationwide – we offer whole scale tree and vegetation removal using our 400 horse powered tracked forest mulcher with operator. Removing anything from standing trees, win rowed vegetation, stumps still in the ground, you name it, we can clear it for you. 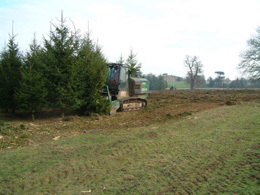 Other work undertaken includes felling, site clearance, Rhododendron clearance, Heathland restoration, Chalkland down restoration, road widening, rail projects, Conservation works, mulcher hire, and whole scale stump removal. Domestic Clients Kent and the South East – we offer tree surgery, tree felling, stump removal, hedge trimming, and shrub trimming. Your enquiry will be dealt with in person by our fully experienced office staff, who will make an appointment for our estimator to visit and provide a free, no obligation quotation. Our professional qualified estimator will arrive on time, introduce himself and discuss fully your requirements, offering advice if needed. A written quote will be sent or emailed to you within a day or so of the visit. You can be assured that all work undertaken is completed by qualified staff with the appropriate insurance cover as we hold full public and employers insurance and all operators are fully certificated under CITB, CSCS, FMOC, or NPTC.